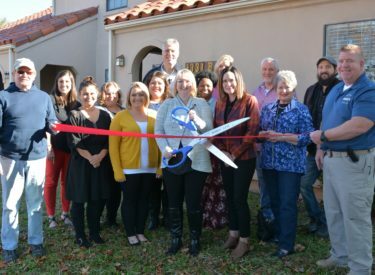 Jamie Phillips, Executive Director for the Marland Children’s Home, along with staff and board members, cut the ribbon for their new direction of service. The Marland Children’s Home will now be working with foster children and families to serve our region. They are shown in front of one of the foster family homes. Holding the ribbon representing the Chamber are Earl Ball and Sean Grigsba.